This is my take on the timeless fairy tale - who really has all the power? hello snapping turtle comics here I'm looking for creative talents for a crowd funding project im doing. Im doing a table-top art book, that will promote my new comic shop, as well as give exposure to the artists within with custom pieces and interviews to go with the art.... if you are interested in participating, please let me know. There are a number of artists involved already but, I'm still looking to expand the book. as an incentive all artists involved in the publishing of this book will receive a copy upon its success. as well as recognition by many artists, publishers and fans. if your interested or wish to know more please message me. Oh wow, this is great! I love all the small things about this that make it unique - as if the characters wouldn't be enough. The cloth she's sitting on, the pattern and how it stands out, and also the little, blue flowers. And the light! And, and, and... Now I'm just listing everything about the painting. Anyway, all in all, it's awesome! I can't come up with anything negative to say about it. Beautiful composition. Thanks for sharing!!! He looks a little forlorn and lovesick. But she has a quiet contented smile of a woman in blissful happiness. 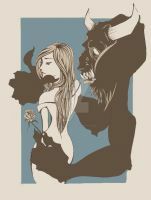 This indicates that the beast has nothing to worry about for she is quite in love with him. This is beautiful. Do you have any advice on how to be able to paint realistically from imagination like that? My advice is to observe and paint from life as much as possible. Get a feel for the mechanics of light and shade and form by constant practice and research. There are many books (mostly free from libraries) that deal with good painting theory, especially those who paint 'plein air' or outdoors. The other thing I would suggest is studying anatomy and life drawing, even if you don't have the opportunity to attend life drawing sessions - we all have human form and we can study form and structure by simply looking in the mirror. The other thing I would suggest is drawing by letting your imagination go nuts, and not worrying about how polished or accurate your results are. Imaginative drawing is a bit like interpreting or remembering dreams...you just grab the initial impression and get it down as best you can so you don't lose the idea. Then you can return to it later and rework it to your heart's content. ...But in a nutshell, there is no substitute for constant old-school practice without a screen in front of you or a CNTRL-Z, or photo reference. The really original ideas will go straight from your head to your hand, and then with practice and research you get to hone your visions more accurately. I hope this makes sense and doesn't sound too intimidating! Thanks for kind words - I do think that lighting can make such a difference to the mood of a painting. Yes, painting (and observing) from life is a good part of it. When you work from life, be it figures or environments, you are relying on your own instincts to interpret your subject. Photo reference can only give you one specific option, which already carries the stamp of the photographer. Nothing wrong with that of course, but calling on your imagination and your eyes first always leads you somewhere new and original. ...I think anyone who shows interest and curiosity deserves a reply! I love talking art and appreciate the contact. Hey Barry, thanks for the kind words! I really like the expression on beast' face and that you've chosen to make him more similar to herbivore creatures (I see monkey and goat features for example) than to carnivores. hey thanks for the feedback...yes, I think it's bit too easy to just lapse into cliche and rely on the usual generic beastie features. I guess I wanted him to demonstrate his acting skills more, and his anatomy less. Great lighting and wonderful narrative story!